JPM's annual report is out, and maybe a good time for another post here. I know it's been a few months. Honestly, I have been coasting recently on what's been working and haven't been digging around too much in the stock market. Most of my time recently has been spent on programming, having taken on a few freelance gigs for fun (and beer money). Anyway, I have updated my website. A lot of things there were broken, but everything broken there was just due to the Google and Yahoo Finance APIs being shut down completely. This is really annoying. There are a lot of books out there on AI, data science, quantitative finance and all that, and a lot of them depend on those APIs, so it's like those books are worthless now. Well, not really... you just have to find an alternative source of data. But who wants to deal with that hassle? People are still talking about how overvalued the stock market is and how it has to go down, and how valuations do matter and that perma-bulls are saying valuations don't matter. Well, I have been telling people to ignore those people for the past few years, and I, for one, would not say that valuations don't matter. Valuations do matter. The higher the valuation, the lower the future returns. Duh. This is not rocket science. This is no different than bonds. The higher the bond price, the lower the yield, the lower the future return. I also quantified this and put the data on the website. I didn't update it, but since the market has been up, the conclusion would be the same or better. Plus, the analysis uses decades of data, so a couple of years is not going to make a difference. As for all the worries and concerns, Buffett's 2018 letter has a great section called "American Tailwind", and it basically says that the market has done well over the past 77 years and there were always things to worry about, but the market did pretty well. Maybe more on that in another post. Anyway, the home page shows the trailing P/E ratio of the S&P 500 index at 21x, and forward P/E of 17x. This may seem high to some of us who started in the stock market business when interest rates were around 8%. They are now much lower than that. I've said in posts that with a "normalized" interest rate of 4% over the next decade, I would not be surprised if the market P/E averaged 25x P/E. So a 21x P/E is not at all alarming or shocking to me, and the 17x forward P/E actually looks pretty attractive, even assuming that forward estimates tend to be over-estimated. Also, looking at the Valuation Sanity Check page, the Dow 30 stocks seem to be trading at 17.5x 2019 estimates and 15.4x 2020 estimates. The Berkshire stocks (just the stocks listed in the annual report) are trading at 15.4x and 13.4x 2019 and 2020 estimates. Again, there are issues of the validity of 'estimates', but even still, these figures are nowhere near bubble levels. My thoughts about the market hasn't changed at all in the past year. Yes, it was a little scary in the fourth quarter of last year, but I was not that particularly worried as none of my work (as shown in previous blog posts) has shown any rubber band stretched to it's limit that must snap back. Google and Yahoo have no obligation to continue their finance data APIs, of course. But what is really annoying is how expensive simple financial data is. It has always been so, and Google/Yahoo made it affordable (or, well, free) for the little guys without big corporate budgets. But that is gone now. As the world continues to move towards open source and open data (look at this great source of free data related to NYC: NYC Open Data), the financial industry continues to be closed and expensive. There was an article in the FT today about people (even rich corporate users) complaining about stock exchanges gouging them on price for access to basic data. As I see it, stock exchanges are basically public utilities. I don't think they should be profit-making entities so long as they are given a legal monopoly (or oligopoly or whatever). It's just makes no sense that we stock market traders/investors must go through the exchanges to trade and the exchanges then accumulate and use that data and sell them for profit. It just makes no sense at all. This stuff should be public information and easily available to the public in various forms. It doesn't cost that much money to provide an API where people can access this information. We can see they are already making tons of money on exchange fees etc. So this is just nuts. OK, so it's not a huge issue for me as stock prices / data is not a big part of what I do. As you know, I am more about listening to conference calls and reading 10-K's and stuff. The only time I use financial data was when I was putting stuff up on the website for fun; I don't need that stuff to invest (and that's why I haven't paid for any data service, and don't really plan to). The idea of open-source is that if you make the information free and widely accessible, more people can play with it and more ideas can come out of it. No offense to Mr. Buffett, but I sort of look forward to Dimon's letter more than Buffett's these days. Buffett still writes great letters and I read them as soon as they come out. But I feel like I am very familiar with what he has to say and there are usually no surprises, and I am not sure I really learn anything from reading them lately. But Dimon's letters are much more granular and deal with a lot of specific, current issues etc. Anyway, I don't plan on going into detail here as you can just go read it yourself (and I know many of you won't, but I don't care... it's your loss if you don't!). Here are my usual favorite charts. These tables are really great; they show how Dimon has done as a CEO. Below is the same look but based on the stock price instead of TBPS. BRK's stock price appreciated around +9.3%/year in both time periods (1999-2018, 2004-2018). This is kind of insane. I will not repeat them here, but Dimon goes on in great detail about how we can make things better here in the U.S. It's too bad that our system does not allow for people like Dimon to become president. He would make an incredible one. Anyway, he does caution us away from the creeping socialism and rising progressives from the far left. I am actually very sympathetic to this recent movement even though I am a hard-core capitalist. But I can see how it can be dangerous for us to veer too hard to the left and destroy things that have worked for us. But the fact is that what has worked for "us" hasn't really been working for a very large number of people. It's been a while, but I haven't really changed my mind on anything at all. Nothing new to report, really. The market looks fine. No bubble at all as far as I'm concerned. Maybe not cheap, but not really that expensive either. The way stock exchanges use data as profit centers is deeply disturbing and is not consistent with what I think of as their mandate as virtual public utilities. The whole system of exchanges charging money for data, and a whole industry of data vendors runs contrary to the worldwide trend everywhere else of open-source and open-data. OK, way back in the old days when you needed expensive mainframes to manage this stuff, it may have been understandable. But with technology where it is today, this whole data industry setup and cost makes no sense at all. The industry must be laughing their way to the bank as costs keep going down and the prices they charge keep going up. JPM continues to do well and it looks like in may ways they are disrupting themselves, which is really great. It assures (or increases the odds) of their continued success. They have come a long way since I opened my first bank account at Chase many years ago. I probably told this story here before, but I'll tell it again. When I had my first job in the city, I needed to open a bank account somewhere so my employer can deposit my paycheck. I figured all big banks are the same, so I went to the World Trade Center (near where I worked and lived) and walked into Citibank. There was a reception desk at the front and I said I wanted to open a bank account. A big-haired girl, loudly chewing gum and filing her nails barked at me, "I'm on break. Come back later...". She was sitting at the reception desk/booth. I was shocked at how rude she was, so I just walked across the hall to Chase and said the same thing, and someone immediately came and helped me out. Chase was not that much better; it was pure chance that the Citi employee was on break and Chase's wasn't. This is the only reason why I started at Chase. Unbelievable. But that's how big banks were back in the 90's. Just terrible. Like the post office. Anyway, JPM is no longer no-brainer cheap like it was when this blog first started (2011), but it still seems pretty cheap. Every now and then, BRK comes up in conversations with people (and often with people not in the business) and the topic becomes, what to do with BRK post-Buffett. I tell them I own BRK and plan to own it for a long time, and sometimes I wonder why myself. First of all, it's really big now so it's going to be hard to grow the way they used to. With a market cap of more than $500 billion, it's going to be hard to keep growing at a high pace. This used to be sort of the cap in big company capitalizations; a lot of the bit techs went to $500 billion in 1999/2000 before they all came crashing down. The barrier today seems to be $1 trillion; Maybe these $1 trillion companies hit that wall and come crashing down. Who knows. In any case, BRK is just too big to get too much alpha going forward. Buffett is not so young anymore, so the historical performance is getting increasingly less relevant; Buffett created the performance of the last half a century, but he is clearly not going to lead the charge for the 50 years. This doesn't mean BRK can't outperform. Buffett hired some great managers to help manage the equity portfolio, but their historical performance is sort of irrelevant too. Those guys posted great returns with a much, much smaller capital base. They will eventually inherit a $200 billion+ equity portfolio. If they want to stay focused, they will need to invest in companies they can buy $10-20 billion worth of. And there aren't a lot of those. Their universe will be no bigger than the one Buffett is fishing in now, so it's hard to imagine they will improve on what Buffett can do with this size. People often point to this to show that the era of BRK outperformance is over. But this sort of misses the fact that back in 2008, the S&P 500 was down -37% while BRK's BPS declined only -9.6%. So in a sense, the S&P 500 index had a lot of catching up to do compared to BRK. Looking only at the above table of the last five years misses a lot of crucial information. Having said that, it's true that the supergrowth of BRK ended back in 1998, but has been a steady grower since then. Check out the below log chart since 1980. You can see two clearly different eras in terms of performance. 1980-1998 was just amazing, but 1998-2018 has been much more modest (data just happened to be available since 1980 as I was playing with daily data; no cherry-picking start/end points. Good enough for this analysis). BRK's BPS grew +28%/year from 1980 through 1998 vs. +18%/year for the S&P 500 index for an outperformance of 11%/year. BRK's stock price rose +33%/year in that period, beating the index by 15%/year. Since then, things have flattened out a little, but the returns aren't that bad at all. I haven't updated this table in a while, but let's take a look at BRK's performance against the S&P 500 index (total return) in various time periods. Of course, we know how great the performance has been since 1965. But check out the past five years. On a BPS basis, BRK underperformed the S&P 500 total return, but outperformed based in BRK's stock price. 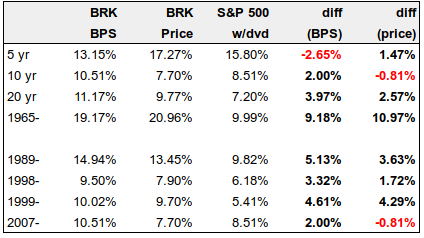 If you look at all the time periods, though, BRK has outperformed both on a price and BPS basis in most time periods. But to me, more interesting than looking at the past 5 and 10 year returns (which are no doubt important), is to look at 'through-cycle' performance. The lower part of the above table shows returns from various market peaks (year-end basis). You will see that on a BPS basis, BRK has outperformed the S&P 500 index since the 1989, 1999 and 2007 market peaks, and also on a price basis in most of those time periods. 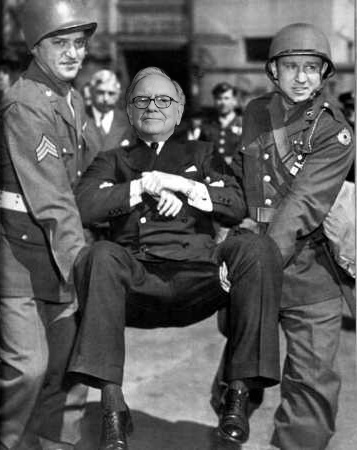 So all this talk of Buffett not performing well is not so relevant to me. It looks funny to have both 1998 and 1999 in there, but 1999 is there as a market peak, and 1998 for sort of a momentary peak in relative performance of BRK, and sort of the end of the high-growth era for BRK. Despite the size, and the potential risk of a post-Buffett BRK, why do I still like BRK? First of all, the recent performance, I don't think, is as bad as people make it out to be. They are still outperforming in most time periods, especially from various market peaks. There is something about BRK that makes me more comfortable than owning the S&P 500 index, even with the post-Buffett risk. The first thing is that BRK will probably not do anything irrational or stupid. This is not an assurance we get when investing in the S&P 500 index. The index committee will add bubble-ish stocks at bubble-ish prices. BRK will not be 'forced' to buy stocks just because they are 'big'. They will only buy stuff when it is high quality and is priced rationally. These are two things that the S&P 500 index committee do not seem to care about too much. Sure, this inflexibility with regard to price and quality will be a drag on performance during certain time periods (like now, and back in the late 1990s), but I would feel more comfortable when my money manager is not chasing big stocks. Also, check out the below chart. It's just the S&P 500 index since 1980 along with the BRK/S&P 500 index ratio. I just wanted to see, visually, how BRK has performed (price-wise) versus the index over time. And what I see is kind of interesting. BRK seems to not do too well in late periods of raging bull markets (like the late 1990s) but seems to pick up a lot of relative performance during rocky times. This is kind of important for conservative investors. Whatever you think of the stock market now, there are pockets of bubbliness, and if that pops, it wouldn't surprise me if BRK has another big step up in relative performance like in the two circled periods above. This sort of makes sense, right? As BRK doesn't have a whole lot of exposure to FANG/FAANG stocks. And if the market does decline a lot, that will provide a lot of opportunities for BRK to deploy cash so you are kind of sitting on cash optionality by owning BRK. Yes, BRK declined 50% during the crisis, no better than the S&P 500 index, but if you look at the above table and charts, you will see that BRK does ratchet up relative performance during tough times. So just comparing peak-to-trough drawdowns sort of misses some important information. OK, maybe not. But I just noticed something. 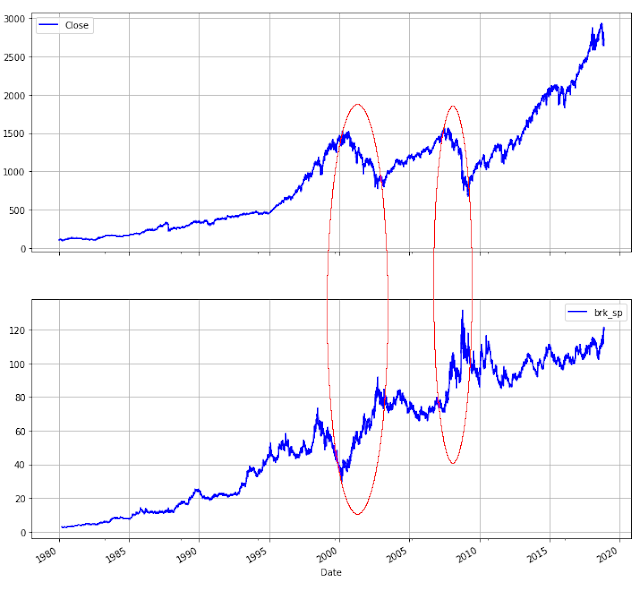 Look at the above chart again; BRK price / S&P 500 index ratio. 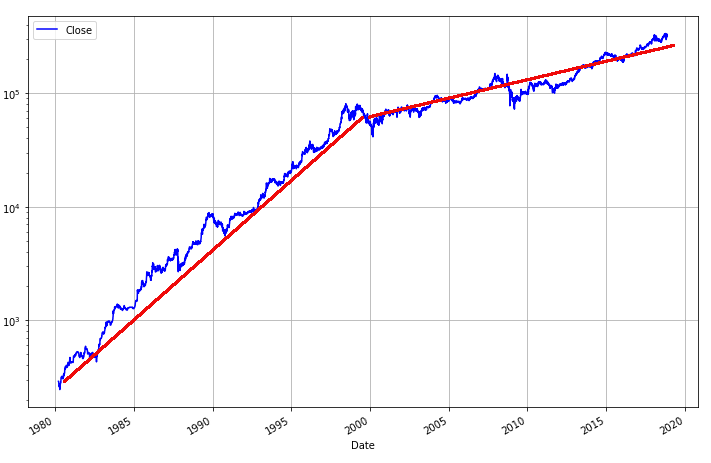 If you look at this chart, you will notice that the uptrend is pretty consistent and linear. OK, I am not going to go back and put a regression line on it (too lazy), but you can sort of imagine a straight line going through it from the mid-90's even through today. And, importantly, there is no kink, bend or flattening after 1998!. What does that mean?! It means the rate of BRK's outperformance against the index has been pretty consistent and hasn't tapered off at all! The ratio will measure the 'rate' of outperformance, not the absolute difference. Here's what I mean. The above chart is based on prices, but I will look at BPS growth instead as the prices data is a little too spikey (and too sensitive to start/end points). As we saw above, in the period 1980-1998, BRK's BPS grew at a rate of 28.2%/year versus 17.7%/year for the S&P 500 index (total return), for an outperformance of 10.5%/year. Since then, BRK's BPS grew 9.5%/year vs. 6.2%/year for the index for an outperformance of 3.3%/year. Looks like big degradation in relative performance. But the linearity of the above ratio chart made me look at this another way. The 1980-1998 28.2%/year is 1.6x the index return, and the 1998-2017 BPS growth of 9.5%/year is 1.5x the index return! So, from now on, I am inclined to answer the question, "How do you think BRK will perform vs. the S&P 500 index in the future?" with, "I think it will do 1.5x better!". Nonsense? Maybe. But it looks interesting to me. This is the danger with playing with charts. Moving on. This is not a new idea, but we can see all the cash at BRK as optionality (even though I have long said that the cash is matched pretty closely to float so wonder how much of the cash is actually immediately deployable. Some of the float might be 'fast', meaning maybe they actually can deploy a lot of that cash and run down the float if necessary). A lot of funds held a lot of cash since the crisis and have severely underperformed the index. The worst fund managers have actually been net short since the crisis and have catastrophically posted negative returns for years on end. Sure, these guys had plenty of opportunity because they were short; if the market went down, they could profit on the decline and then use the profits to go long and make even more money! But, those guys were neither prudent nor rational, and it is unlikely they will ever be able to make up the damage as it is just too big to overcome. And yet, here, we have BRK with all that cash and it seems like they haven't sacrificed all that much in terms of performance. That is really amazing when you think about it. By the way, BRK has $97 billion of cash/cash equivalents on the balance sheet just looking at the Insurance and Other segment. This makes people say that Buffett is bearish the stock market. Well, it's true that Buffett has been having trouble finding stuff to buy, but that doesn't necessarily make him 'bearish'. There is a difference between not finding things to buy, and being bearish (and expecting a market decline). One thing that occurred to me when thinking about this huge amount of cash and short term investments on the b/s is how small the investment in fixed maturity securities is: $18 billion. So first of all, the amount of cash/cash equivalent sort of seems to me like more of a bearishness or unwillingness to buy bonds than stocks. There is only $18 billion worth of bonds in the insurance segment versus, what, $200 billion in stocks? That's not bearish stocks to me, that's more like, bearish bonds! Not to mention BRK has been net purchasers of stocks; not the act of a bear. Here's the other thing. When we look at insurance companies, we often look at investment leverage. For me, since I like risk, I look at the percent of shareholders equity invested in stocks. Markel looks at and talks about that, as it's a big source of their expected BPS growth. So I think about BRK in the same way. Forget about cash vs. float and all that stuff for now. Let's just look at how levered BRK equity is to 'equity'. First of all, the portfolio (including KHC) is $219 billion at the end of 3Q 2018. That's against $379 billion in total shareholders equity (including minority interest). So the ratio of shareholders equity invested in stocks is 58%. That's a lot higher than any other insurance company, and I think higher than MKL has been recently (maybe they are much higher now; too lazy to check now). Of course, this is not like the old BRK, but not at all overly conservative either. Now, keep in mind that BRK has a lot of unlisted businesses. For example, the various businesses in the railroad, utilities and energy used to be listed companies. If these were still listed, they would be included in equities. As far as growth potential is concerned, other than not having to mark to market, these businesses are basically no different than the equity portfolio (ignore the advantages of wholly owned businesses etc.). So from the 'leverage' point of view, we can add this to the equity portfolio. The book value of this segment is $96 billion. With a similar argument for the Finance and Financial Products segment, we can add another $24 billion. Sum that up and you get 'equity investments' of $339 billion. That's against total shareholders equity of $379 billion. So that's already like 90% of BRK's shareholders equity invested in equity of businesses. That's really not all that bearish! This, by the way, doesn't even include the other unlisted businesses, the Manufacturing, Service and Retailing Operations (MSR), which is the 'other' in the Insurance and Other segment. BRK doesn't disclose the balance sheet in detail for this segment, but in 2016, BRK equity in the MSR segment was $92 billion or so. Add this to the above $339 billion and you get $431 billion worth of equity investments at BRK against it's shareholders equity of $379 billion. This is why you get equity-like returns on BRK despite BRK having so much cash/cash equivalents on the balance sheet. This is hardly the balance sheet of a bearish CEO. I haven't even touched valuation here, but from all of the above, I like BRK a little more now than I have liked it in recent years. But the more frothy things seem (well, less so now with the October/November corrections), the more interesting BRK becomes for the above reasons. AND, it is possible that you won't give up much in terms of performance to buy this 'optionality', with, of course, the greatest investor of all time ready to pounce if we have any big disruption in the market. And we can't forget that BRK has a lot more levers to pull than most conventional funds or even hedge funds; they can buy private businesses too, or do add-on deals to augment the many businesses they already own. Plus, all that cash on the balance sheet doesn't mean it's as much a drag on BRK's performance as people make it out to be. As for a post-Buffett world, I think what we need is intense rationality and discipline not to do stupid things. We know BRK is not going to jump into Bitcoin, or buy into bubble stocks (I fear we may find AMZN in the 13-F at an entry price of $3000 some day; that may be a sell signal! ), panic and sell out stocks during a crisis or anything like that. And they will not be subject to quarter-to-quarter performance pressure in fear of redemptions. Many of these (and other) advantages are enough to keep me comfortable with BRK for a long time. Also, even though BRK is not growing the way it used to, and it doesn't look like they are outperforming as much against the index, it looks like a lot of this is due to lower returns in the market in general as the rate of outperformance has been remarkably consistent even after 1998. By owning BRK, you sort of get paid at least market performance while you wait for the optionality to be exercised! Wow. Apple (AAPL) was a $28 billion position at the end of 2017, with 167 million shares, but now BRK owns 252 million shares as of the August 13-F (November will be out soon), for a position size of $47 billion then and $52 billion now (as of 11/4/2018). That sounds crazy as it's the largest position ever, and it's a 'tech' company. OK, maybe it's a consumer products company and not a tech company. Either way, wow, that's a big bet, exceeding 10% of the market cap of BRK. Well, for focused investors, 10% is not such a big deal, and even 25% of the equity portfolio may not be that crazy as AAPL isn't some obscure micro-cap, or over-leveraged industrial cyclical or anything like that. But, I am not the biggest fan of AAPL, so it is interesting. Coming right off his IBM miss, I guess many shareholders would be a little surprised. Of course, I don't recommend it, but this is an easy position to hedge against; you can just short AAPL shares against whatever BRK owns. You can get the whole sorted table here. (oops, the above link shows an error for some reason. You can click 'website' below and then just go to the 13-F section and click BRK). I know a lot of stuff on the website is broken. When I have time, I will fix it and maybe add some stuff to it. When Google finance/Yahoo finance dropped their financial data API's, a lot of things broke and it got to the point where I would have to pay for data to update stuff, and I don't want to do that. I recently noticed that a form of the Yahoo Finance API is back up, so I will be able to update some stuff, but I will have to rewrite a lot of the code, so I am in no rush to do it at the moment (I have a lot of work I need to do for others etc... this stuff goes to the back of the queue, unfortunately). The bull and bear argument has been the same for years, so I don't want to get into it again here, but I feel like AAPL has sort of been chasing the crowd lately rather than leading it or disrupting it like they used to during the Jobs years. But again, this would get the AAPL fans all fired up and angry, so maybe I'll leave it at that. I'll just say that moving up to higher end products to make up for declining growth momentum reminds me of retailers/restaurants that hid declining traffic/unit volumes by moving up-market or raising prices. It works for a while until people finally say, no mas, and will no longer pay high prices. Sort of reminds me of J. Crew, P&G etc. The markets have been going nuts too. Well, I don't mean to imply that Buffett has gone nuts, really. AAPL has a strong brand name/franchise, high returns on capital, decent margins, too-strong balance sheet, repurchases a lot of shares etc. So a lot of the boxes are checked in this case. Can't blame someone for buying a company like that. I hear all the time that interest rates are going up so the market must go down, but all of my work in previous bubble posts were based on the baseline assumption that the 'normalized', sustainable long term interest rate is probably around 4.0%. Using a lot of historical data, I showed that if the long term rate averages 4% over the next 10 years, the market could easily average a P/E ratio of 25x over that time frame. This is not a prediction, of course. It's just an observation based on history: if it's not different this time, and if interest rates average 4% over the next 10 years, then, based on history, a 25x P/E would be completely normal. Yes, this is basically the Fed model, which has been a subject of debate if not completely discredited by some. One debate is that the relationship between P/Es and interest rates held only for a brief period in time and not for the whole 100+ years of recent history, but my feeling is that since interest rates were regulated for much of the early 20th century, it's hard to say if there is any meaning in the lack of correlation going too far back in history. The other argument is that P/E or E/P is 'real' whereas bond yields are not. But this argument only strengthens the above argument. A low E/P is even more attractive than a low bond yield as the E will increase with inflation whereas the bond yield will not. And comparing earnings yields to the TIPS yield (which would take care of the real versus nominal problem) would just be silly as the TIPS yield 10 years out is 1.2%, suggesting a P/E multiple of 83x. So, watching the market throw conniptions because interest rates went above 3.0% didn't worry me at all. I thought, OK, well, whatever. All else equal, higher rates may equal lower equity prices, so people dump stocks when rates go up. But as I've said in my bubble posts, I don't see the rubber band stretched at all, so the market is not in need of a violent correction. Of course, if we are on our way to 6-8% long term rates, then that's a different story. When markets go crazy like this, people tend to ask me about hedging. Well, first of all, hedging is something to do before the market goes down, not after. It's interesting that people start to want to hedge after the market starts to go down and volatility goes up (hedging costs go up). I've spent a lot of time in the derivatives business, and a lot of it is about hedging. There are a lot of good and valid hedges; interest rates, FX, commodity prices etc. But when it comes to the stock market, a lot of hedging is baloney. Some large institutions may use futures to synthetically adjust their asset allocation (sometimes cheaper than selling stocks, paying taxes and buying something else). But when it comes to just directional hedging of the stock market, I think more money has been lost trying to do that over the years than any money actually lost in the stock market. I know for sure that if you try to hedge a stock portfolio with futures, options or swaps, it's going to cost you. If you need to hedge your portfolio using any of these, most of the time, you are just better off lightening up your position and forget about hedging. If you feel like you need to hedge your portfolio with put options, you probably just own too much. If you hedge all the time, it's going to be very costly. I'm not going to do it, but just go look at some put option quotes on the S&P 500 index, for example. And imaging rolling that over every three months, or every year. It is not cheap at all. And if you think you can time it and put on hedges only during risky times, well, that usually doesn't work out either. Some very good investors thought the market was expensive a few years ago and hedged their portfolios and it was a disaster. Even the smartest can't time their hedges. If you look at how wealth is built up over the years, most of the time, it's been created by people who hold very good assets for very, very long periods of time. Nobody gets rich by being very good hedgers of their portfolios. OK, there are some hedge fund managers who have done it over the years, but that's pretty rare. Most other people, if you look at the richest people list, just own good assets and don't try to get in and out according to how they feel about the market or the economy. In a sense, people like Buffett and Bill Gates are kind of lucky in that they can't get in and out of their positions anyway, even if they wanted to. Imagine Gates calling Goldman Sachs, "I want to put on a zero-cost collar on Microsoft because I don't like where we are going in this economy!". Nope. Won't happen. I know hedging CEO holdings used to be a big business for derivatives desks a while back; maybe it still is. But if you look at the guys who create tremendous wealth, most of the time, they just own and hold onto great assets for long periods of time. Real estate wealth is built the same way (but they get leverage, and their buildings are not marked to market so they never get margin-called; that's a huge advantage versus leverage in the stock market). They can't just buy and sell futures, options or swaps against their holdings. And they can't trade their buildings short-term either. As I've said before, the stock market suffers a sort of "curse of liquidity". Since you can just liquidate your entire portfolio by pushing one button on your iPhone (OK, well, maybe not some rich people, but many of us can...), it is easy for us to do stupid things. And you can see how much you are losing every second of the day on your iPhone. You can't do that with real estate; there is no way to tell exactly what it is worth until you put it on the market and get some bids. In other words, there is no manic-depressive Mr. Market knocking on your door every micro-second in real estate (unlike stocks) tempting you into doing stupid things. So 1. there is no stupid-behavior-inducing signals (crashing prices) and 2. there is no way to act immediately on impulse in the real estate market. Most people would do better in the market if they treated their equity portfolio like their home. What a total disaster GE is. I've always admired GE and it was one of those companies that I really wanted to like and wanted to own, but it never quite worked for me. First of all, Jeff Immelt must be the worst CEO of all time. OK, there are CEOs that bankrupted companies, committed fraud etc. So in that sense, maybe he's not the worst. But as a non-criminal, blue-chip CEO, he's got to be one of the all-time worst. And it's not just about the stock price; the businesses are just horrible. It looks like he stood up and got hit with a left hook, ducked to avoid the next shot only to get a big upper-cut to his chin. Whatever he did seemed just wrong. I remember when Buffett was talking about CEOs, and this was around the time that Irene Rosenfeld sold the frozen pizza business for cheap and overpaid for Cadbury. He was talking about how many CEOs are great operators but many have issues with capital allocation. We all thought he was talking about Rosenfeld, but it didn't occur to me that he was probably also talking about Immelt. He often said how wonderful Immelt was as a CEO but never actually bought GE stock (or in any size that I can recall; it was never a top holding), and I always wondered about that. In hindsight, well, he was probably also talking about Immelt. GE is really tempting now at under $10, and the CEO is a really good one, but I'm not sure how GE gets out of this. Frankly, I haven't taken a close look at this in a while; maybe I will. If I find anything interesting, I will probably make a post here. But I just don't like (and never liked) the businesses these guys are in. It's mind-boggling how Immelt just seemed to run the other way than the world was moving. Has Buffett Lost His Mind?! OK, so back to Buffett. Has he lost it? Is he buying more AAPL shares? Does he need intervention? Should he undergo some tests to make sure he is OK? I have no idea. I'm sure he is fine, and all accounts (from the annual meeting etc., and is interviews on TV) seem to indicate he is fine. I guess AAPL is so big because it's the first time in a long time that he really got to like something and it was large enough so that he can actually buy a ton of it. Remember, he was capped at 10% on Wells Fargo due to bank regulations. I own BRK, and I don't really like AAPL, but I'm not going to hedge out the AAPL piece.